Glass House Mountains National Park is a heritage-listed national park in the Australian state of Queensland, 70 km (43 mi) north of Brisbane. It consists of a flat plain punctuated by rhyolite and trachyte volcanic plugs, the cores of extinct volcanoes that formed 27 million to 26 million years ago. The mountains would once have had pyroclastic exteriors, but these have eroded away. The park was established in 1994. On 23 June 2010 the Queensland Government announced the expansion of the park to include an additional 2,117 hectares. The Glass House Mountains were named by Captain James Cook as he sailed north up the coast of what is now Queensland in 1770 as part of his incredible voyage aboard his ship HM Bark Endeavour. They were so called as the shape of the mountains reminded him of the huge glass furnaces (glasshouses) back in his native Yorkshire. Mount Tunbubudla or the Twins, 312 and 293 m The twins are one mountain. Mount Beerwah is the highest peak within the park at 555 m (1,821 ft) however public access to the 'tourist track' in the National Park has been restricted since 2009. Mount Coonowrin 377 m (1,237 ft) is the second highest however public access to it has been prohibited since 1999 and Mount Tibrogargan at 364 m (1,194 ft) is the third highest which is open. Walking track allow access to the summits of Mount Beerwah, Mount Tibrogargan and Mount Ngungun, however climbing of Mount Coonowrin is prohibited due to the danger of trachyte rock stability. The Glass House Mountains National Park was listed on the Queensland Heritage Register in 2007. Camp grounds are available at Coochin Creek, west of Beerwah. Lookouts have been built at several of the summits. Access is via the Steve Irwin Way exit from the Bruce Highway. ^ Cohen B.E., Vasconcelos P.M., Knesel K.M. (2007) 40Ar/39Ar Constraints on the Timing of Oligocene Intraplate Volcanism in Southeast Queensland. Australian Journal of Earth Sciences, vol. 54, pages 105-125. ^ Knesel K. M., Cohen B.E., Vasconcelos P. M., and Thiede D.S. (2008) Rapid change in drift of the Australian plate records collision with Ontong Java Plateau, Nature vol 454, pp. 754-757. ^ a b Explore Queensland's National Parks. Prahran, Victoria: Explore Australia Publishing. 2008. pp. 14–15. ^ a b c Shilton, Peter (2005). Natural Areas of Queensland. Mount Gravatt, Queensland: Goldpress. pp. 160–162. ^ Mount Beerwah track closed - Glass House Mountains National Park. Department of National Parks, Recreation, Sport and Racing. Retrieved 6 May 2013. ^ .Leiper, Glenn et al. (2008) Mangroves to Mountains: a field guide to the native plants of south-east Queensland - Society for Growing Australian Plants Logan River Branch, Browns Plains QLD. 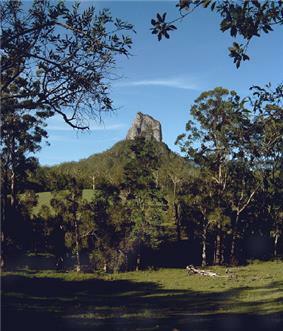 ^ "Glass House Mountains National Park and Beerburrum Forest Reserve 1 (entry 19618)".